What are JBeret and jberetweb? JBeret is the out-of-the-box JSR352 JBatch implementation of the WildFly application server. It manages its statuses of jobs and steps in several types of data storage, like RDBMS, which is called repository. But it has no management console or even a standardized way to see it efficiently (I've been watching the repository through SQL!). So, I have created jberetweb as a small web application which shows the JDBC job repository of JBeret. jberetweb can be obtained at GitHub. What can be done with jberetweb? 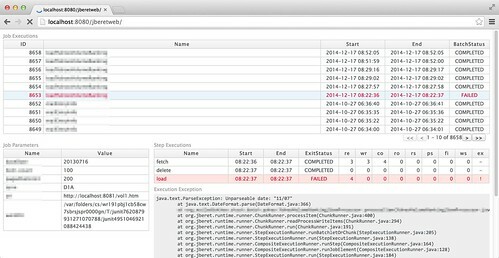 It shows recent job executions with their names, the start/end time and the batch status on the table in the upper half of the page. These rows are clickable. Additional information, like job parameters and step executions, will be shown when any row of the job executions table is clicked. Execution exception data will be shown if the step has failed because an exception occurred. Any problematic rows, such as a failed execution or step, are highlighted. Thanks to JSF's partial rendering and Ajax, paging and operations are fast. As I described at README.md in GitHub repository of it, you have to clone and build it with mvn yourself, and some configuration is needed for WildFly before deploying the WAR. JBeret creates the schema automatically if any tables aren't found, so make sure the database user can execute DDLs. Use XA datasource for both the job repository and your application database. I would be grateful for your feedback because it's my first software which is public on GitHub.